Meet the Whamo Max Flight - It's small. And it's fast. It's a throw and catch machine. PDGA approved, it's the Frisbee that goes the distance - soaring over 100 yards. You simply gotta have it. This is the brightest Glow-in-the-Dark Frisbee ever! It glows more than 30 minutes. Play all day, fly all night. All you have to do to make it glow is expose it to direct light for 60 seconds. Meet the Whamo Max Flight - It&apos;s small. And it&apos;s fast. It&apos;s a throw and catch machine. 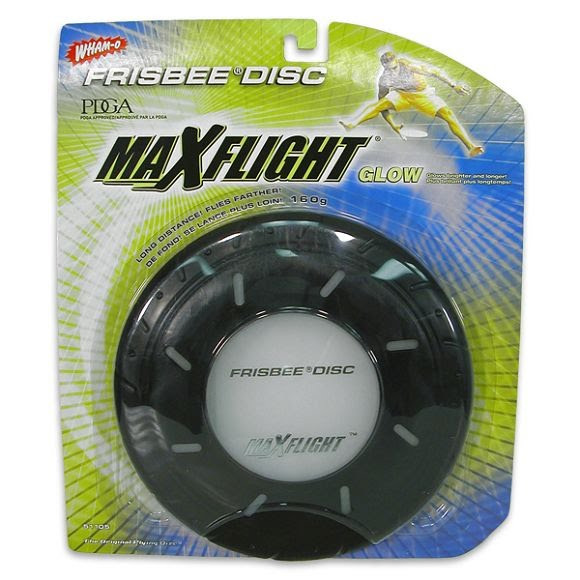 PDGA approved, it&apos;s the Frisbee that goes the distance - soaring over 100 yards. You simply gotta have it. This is the brightest Glow-in-the-Dark Frisbee ever! It glows more than 30 minutes. Play all day, fly all night. All you have to do to make it glow is expose it to direct light for 60 seconds. No batteries to charge or to weight down your throw. Has been thrown over 350 feet and caught! Assorted colors - Please call our customer service department 1-800-800-5083 for specific color selections. Disc Type Long Distance: has been thrown over 350ft and caught!